Jennifer Tank, the Ludmilla F., Stephen J., and Robert T. Galla Professor of Biological Sciences, has been named a Leopold Leadership Fellow. The Leopold Leadership Program was founded in 1998 by the Stanford Woods Institute at Stanford University to fill a critical gap in environmental decision making. The goal of the program is to further the development of sustainable policies and practices by getting scientific knowledge into the hands of government, nonprofit, business leaders, and the public. Tank is one of 20 Fellows selected for 2013 and was chosen for her exceptional qualifications, demonstrated leadership ability, and strong interest in sharing her knowledge beyond academic audiences. As a Fellow, Tank will take leadership and communication courses so that she can turn her knowledge into action by engaging with decision-makers, media, and the public. Tank’s research focuses on the influence of human land use on stream ecosystem function. Fossil fuel combustion, agriculture fertilizer application, and legume cultivation add large amounts of fixed nitrogen to terrestrial and aquatic ecosystems. Her goal is to better understand the role that small streams play in removing nitrogen from the water and to prevent it from polluting downstream ecosystems. 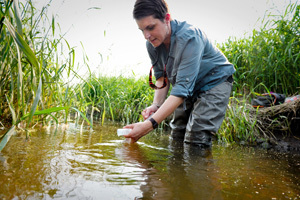 She is also affiliated with the Environmental Change Initiative at Notre Dame, a strategic research initiative that studies the interrelated problems of invasive species, land use, and climate change.